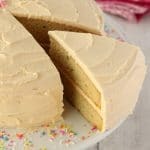 This vegan lemon cake with velvety lemon buttercream frosting is perfectly moist and spongey and will make all your lemon cake dreams come true! 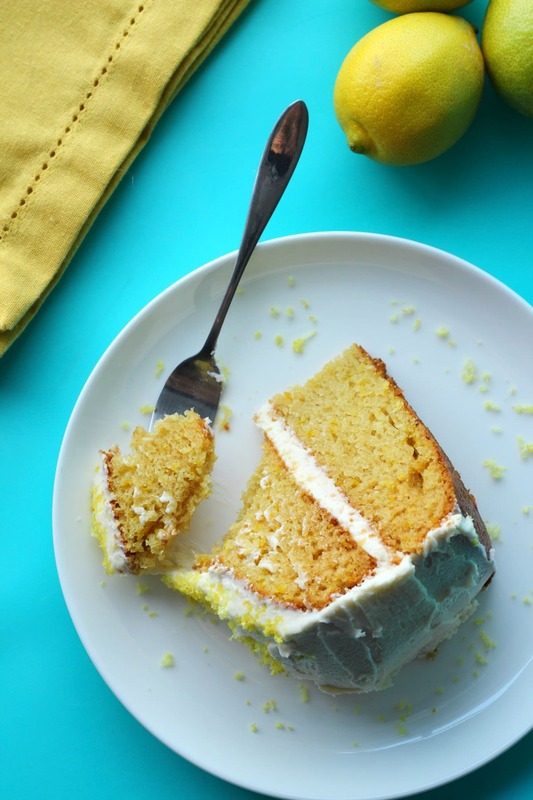 This vegan lemon cake is pure lemony perfection! Jaye was saying it’s exactly like the lemon cake his grandmother used to make! Which is high praise considering his grandmother was quite the chef. 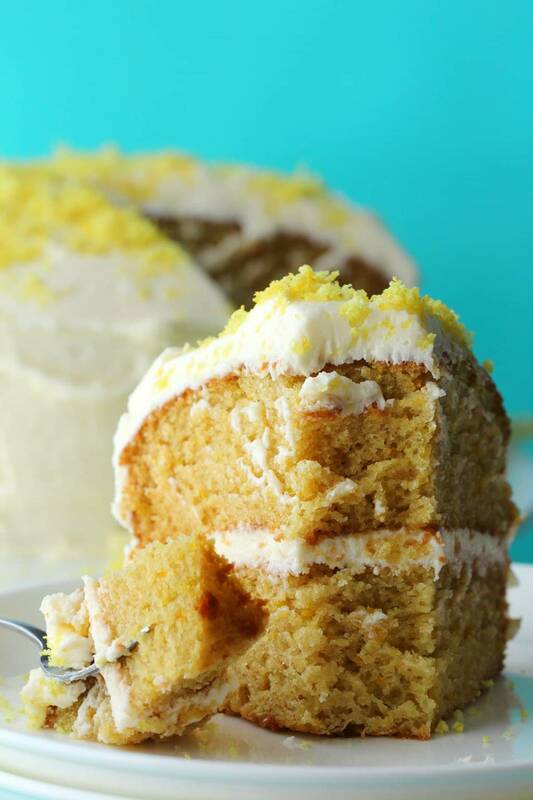 The recipe is based on our vegan vanilla cake, with lots of lemon flavor added in via lemon zest and lemon extract and of course, a delicious lemon buttercream frosting and lots of lemon zest as decoration. 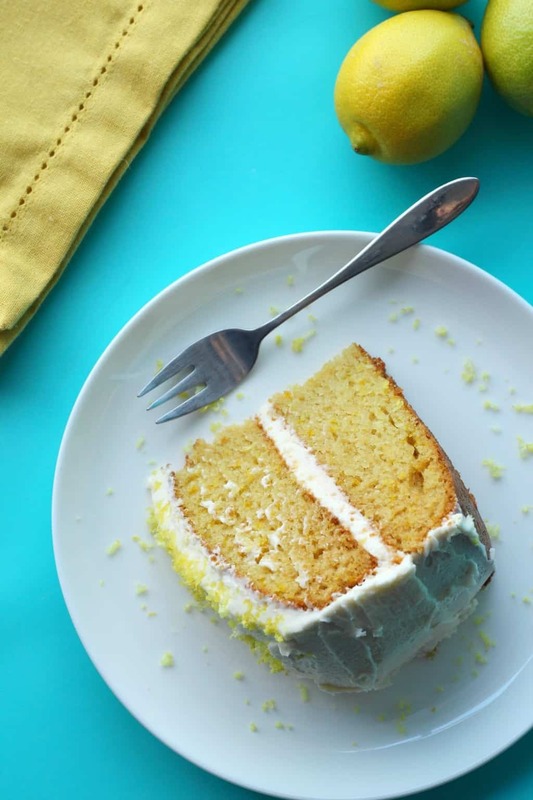 It’s super easy, and will happily fulfil all your lemon cake dreams! When looking around the web at lemon cakes in general, I saw a lot of lemon loaf cakes. And I definitely want to make one of those too! 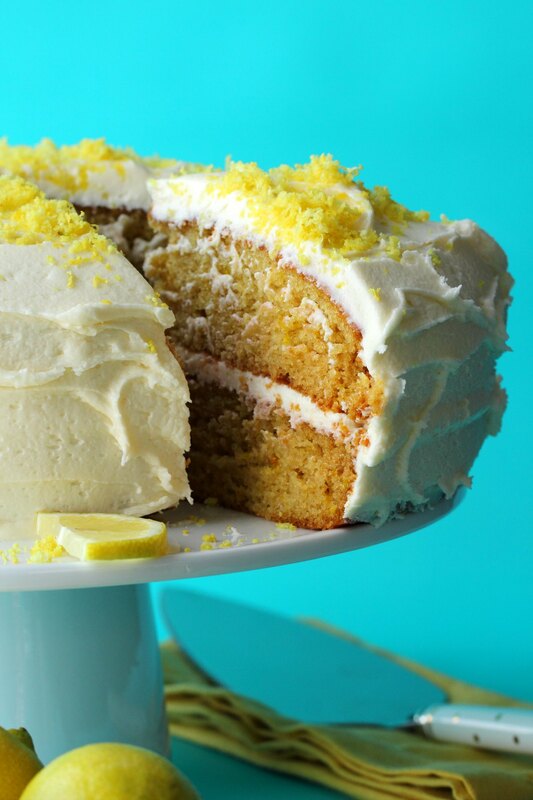 But that isn’t what comes to my mind when I think of a lemon cake, to me a lemon cake is a lemon layer cake, and a lemon loaf cake or a lemon pound cake is the loaf cake. Anyway, just saying because I hope you didn’t come to this page hoping for a loaf cake. I went with two 8-inch cake pans for this cake. Usually my preference has been for 7-inch cake pans, but I have broken out. I got some 8-inch and 9-inch cake pans and I am going to be making a bunch of cakes for them now! And don’t these layers look fat and gorgeous? They rise just beautifully! I didn’t use a flax egg in this cake, which I also don’t use in my vanilla cake recipe that I based this recipe on. I don’t find I need it in this recipe and I don’t want it to affect the color. In light colored cakes, a flax egg can affect the color leading it to look a bit spotty, so in this case it’s best to leave it out. So there isn’t any specific egg replacer in this recipe, unless you count the baking soda/vinegar combination, which definitely acts together to create some crucial baking science that causes the cake to rise beautifully. Somehow it all just works. That’s all I’ve ever done with my cakes, try things and see if they work, and they definitely do! At least the ones published here do, the failures don’t make it to the blog (of course). Can I make this cake gluten-free? You can use a gluten-free all purpose flour blend to replace the regular flour, but if you do that I would recommend you increase the oil by around 1/4 cup and perhaps add a couple of tablespoons of applesauce too. I have not tested this recipe as gluten-free but that is what I would do based on what I know about gluten-free baking. 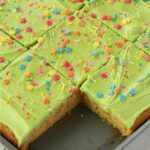 It may also alter the baking times slightly, just keep an eye on it and make sure it passes the toothpick test – a toothpick inserted into the center of the cake must come out clean – to know it’s done. Can I make this recipe into cupcakes? We’ve already done it! Check out our vegan lemon cupcakes recipe. Can I just use lemon juice instead of lemon extract? Well, sure you can, but the lemon flavor will be lessened quite a bit. I do recommend getting some lemon extract if you possibly can. 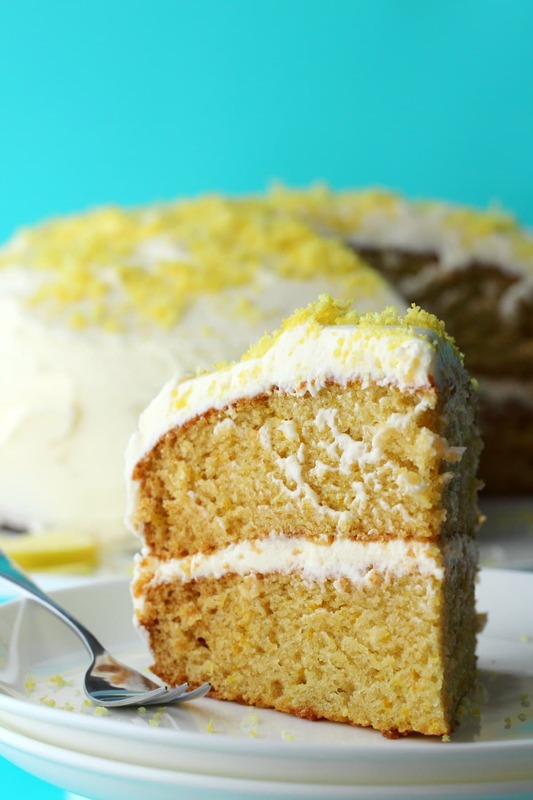 Topped with velvety lemon buttercream! Keep it covered at room temperature where it will stay gorgeous for a few days or keep it covered in the fridge where it will last for up to a week. Our vegan white cake is a classic 8-inch beauty which is pretty much a vanilla cake, just with attempts to make it even whiter in color! 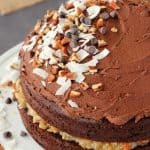 Our recipe for the best vegan chocolate cake can be made in either 8-inch or 9-inch cake pans whereas our classic vegan chocolate cake is a 7-inch sponge cake topped with a velvety chocolate frosting. 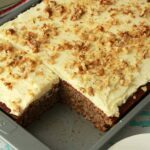 Our vegan banana cake can be made as a 9×13 sheet cake or a 2-layer 8-inch cake. 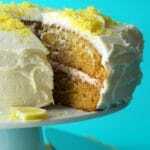 It’s also topped with a delicious lemon frosting. Our vegan coffee cake isn’t just a cake to eat with your coffee, it’s actually a coffee flavored cake! Topped with a kahlua frosting it’s a real treat. Our vegan red velvet cake has a beautiful vibrant color and it’s perfect for special occasions and our vegan carrot cake is always very popular. 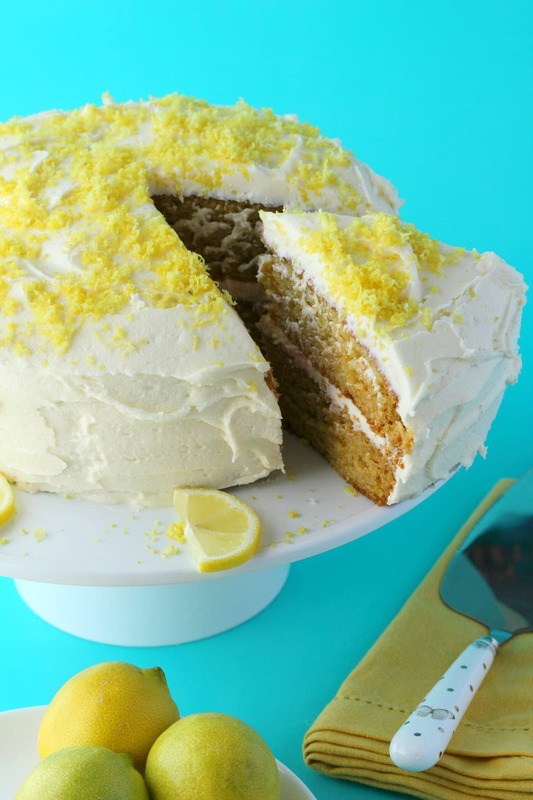 So what do you think of this gorgeous vegan lemon cake? Let us know in the comments and please be so kind as to rate the recipe too. Thank you! While you’re here, why not sign up to our email list, you’ll get an awesome free recipe ebook, and you’ll stay updated with all our latest recipe posts too! Woot! Spray two 8 inch cake pans* with non-stick spray and line the bottoms with parchment paper. Set aside. Sift the flour into a mixing bowl and add the sugar, baking soda and salt. Then add the soy milk, olive oil, vinegar, vanilla, lemon extract and lemon zest. Whisk with a hand whisk briefly until nicely combined and no big lumps remain. Don’t overmix, tiny lumps are okay. 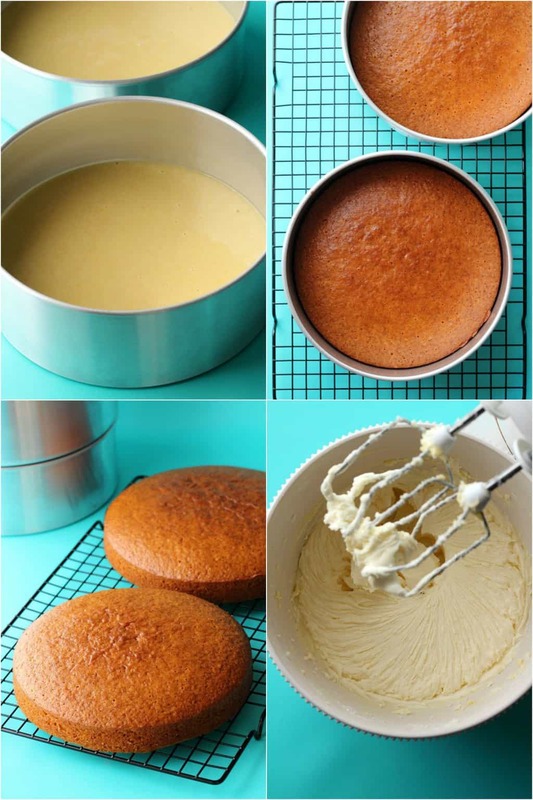 Divide the batter between the two cake pans and place into the oven to bake for 30 minutes or until a toothpick inserted into the center of one of the cakes comes out clean. Remove the cakes from the pans and place onto a wire cooling rack to cool completely before frosting. Prepare your frosting by placing the powdered sugar, vegan butter and lemon extract and lemon juice* into the bowl of an electric mixer. Start off at slow speed, gradually increasing speed until thick and smooth. Frost the cooled cakes and decorate with lemon zest. *You can switch the extra virgin olive oil for canola oil or other vegetable oil if you prefer. Any vegetable oil will work great here. 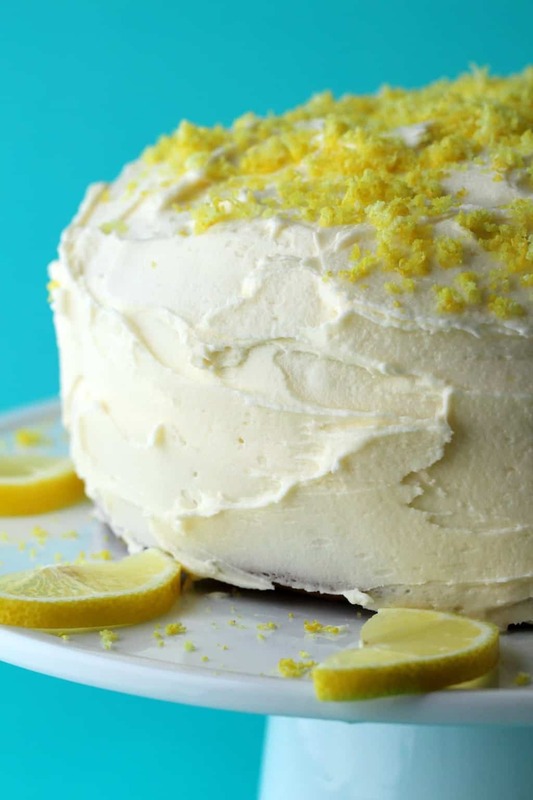 *2 Tbsp of lemon zest is from about 2 lemons, but it does depend on the size of the lemons, if it’s a large lemon you might get 2 Tbsp worth of zest from 1 lemon. 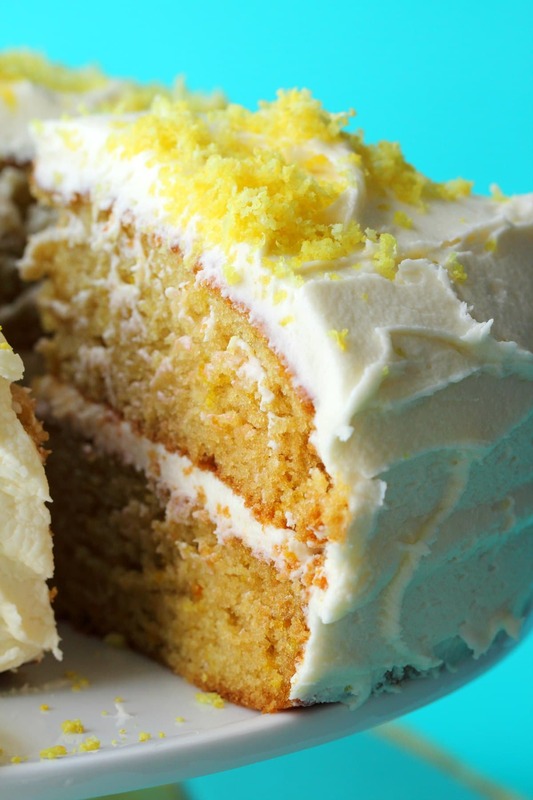 *You might not need all the lemon juice in the frosting. I used all of it, but how much you need will largely depend on the brand of vegan butter you use. If you use a firmer type of vegan butter (lower water content) you will need more lemon juice, whereas if it’s more of a soft spread (higher water content) you may need less. So this will require a little flexibility. *This cake recipe can also be made in 9-inch cake pans with no other changes. The layers will be slightly thinner, but still perfect! The cooking time will be the same. I’ve tried making this twice and have not been able to get the beautiful fluffy yellow layers you get. I get really thin layers that ate very sticky and I have needed ~8 extra minutes. I use King Arthur Flour Measure for Measure gluten-free flour, which has worked well for me in many other cakes. 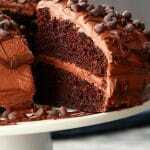 The taste of the cake is delicious, I just wish I knew how to make it come out so beautifully. Made this cake for my roommate’s birthday and it turned out great! I didn’t want to use lemon extract so I just upped the amount of lemon juice in the cake itself (to around 5 tablespoons) and added a little more flour. Same with the frosting and just added more confectioner’s sugar. I also added a layer of raspberry jam in the center of the cake and it was delicious! Garnished with raspberries and lemon zest around the edge. Thanks for the recipe! It was a hit!